This is Hall's Dashing Traveler. He is a blue tuxedo. 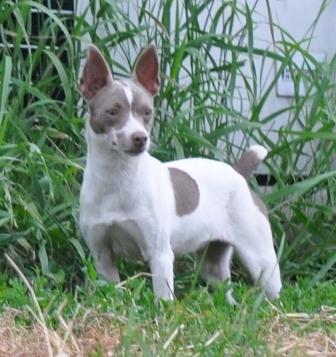 He comes to us from Rainbow Rat Terriers. Traveler is a wonderful, sweet dog. He is sired by Dashing and is out of LJ's Ms. Rissa. He weights 16 lbs and stands 13.5" tall. PLL Status: Carrier Traveler is now retired from breeding. Smokey is sired by VH's Obsidian Hall and is out of Hall's Sunny Day. 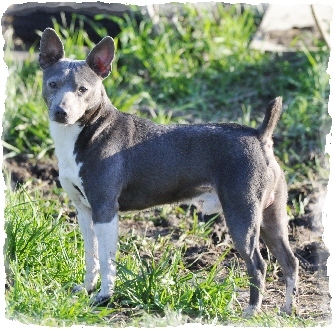 He is a blue sable bi-color. He weighs about 10 lbs and is PLL clear. The bottom picture he is at the St. Lawrence County Fair. My son is a carpenter and Smokey is a sawhorse. Meet our new stud dog prospect! Trusty is sire by Hall's Dashing Traveler and is out of Taylor's Faithful Hannah. He is a black & tan tuxedo. He is a natural bob and is PLL Clear. It looks like those button ears are here to stay. 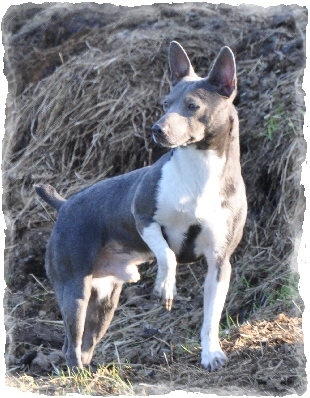 Wonder Boy is sired by GRCH K2'S Bad Boy Holiday and is out of K2'S Sobe A Sharpshooter. His sire is number 1 on UKC's Top Ten list for 2015. He is a chocolate tri-color. He is PLL clear by parentage. Teton is sired by Hall's Trusty Traveler and is out of Hall's Smokey Nadine. He is a blue fawn tuxedo. He is PLL clear by parentage. General is sired by GG's Arapaho Chief and is out of Hall's Brilliant Brielle. He is a black tuxedo. He weighs about 16 lbs. He is PLL Clear by parentage. Nakita is sired by Hall's Regal Blue and is out of Hall's Nigerian Doll. She is a black tuxedo and weights about 9 lbs. She is PLL Clear by parentage. Natalie is sired by Hall's Regal Blue and is out of Hall's Nigeria Doll. She weighs 13.5 lbs. She is 13" tall. She is a blue & tan calico tuxedo. PLL clear by parentage. Pearly is out of Hall's Carl Quik and Hall's Blueberry Muffin. She is a pearl tri-color. She weighs about 10 lbs. She is PLL clear. Nadine's sire is Hall's Smokey Blue and her dam is Hall's Noble Natalie. 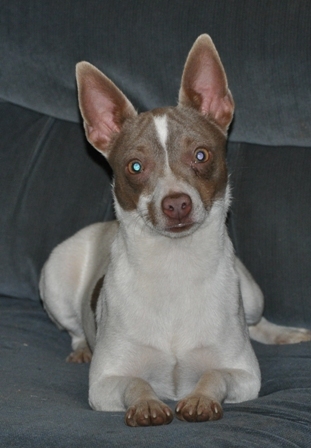 She is a blue fawn tuxedo with a blue mask. She is PLL clear by parentage. Roni is sired by Hall's Dashing Traveler and is out of Hall's Very Violet. 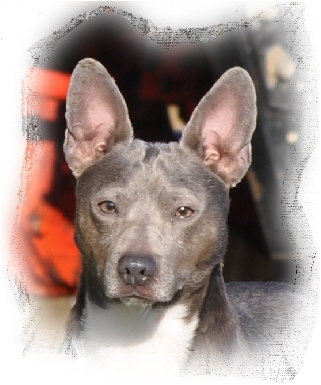 She is a blue bi-color and weights around 12 lbs. She is PLL Clear. 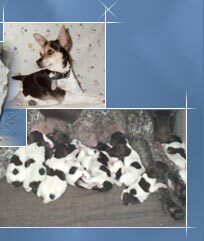 Amaretto's sire is Hall's Smokey Blue and her dam is Hall's Blueberry Muffin. She is a blue tri-color. She weighs about 14 lbs. She is PLL Clear. Snowflake is Sired by Hall's Regal Blue and is out of Hall's Amaretto Muffin. She is a pearl bi-color. She is PLL Clear by parentage. 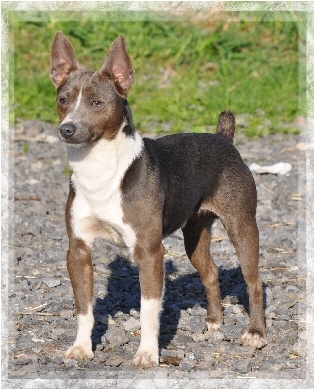 Josie is sired by GRCH K2'S Bad Boy Holiday and is out of K2'S Sobe A Sharpshooter. Her sire was number 1 on UKC's Top Ten list for 2015. She is a chocolate tri-color. She is PLL clear by parentage. Brielle is a blue tuxedo. She is sired by Hall's Regal Blue and is out of Hall's Black N' Bluiser. She is PLL Clear by parentage. Mercy is sired by Hall's Smokey Blue and is out of Hall's Kindness is a Virtue. She is a red sable bi-color. She is one of my smaller females and weighs around 7 lbs. She is PLL Clear by Parentage. Espresso is sired by Hall's Trusty Traveler and is out of Hall's Amaretto Muffin. She is PLL clear by parentage. Jolanda is sired by K2's Sobe a Wonder Boy and is out of Hall's very Violet. She is a lemon bi-color. She is PLL Clear by parenatage. Coquille is sired by GG's Arapaho Chief and is out of Hall's Smokey Nadine. She is a red sable bi-color. She is PLL Clear by parentage. Grace is sired by Hall's Regal Blue and is out of Hall's Kindness Is A Virtue. She is a black tuxedo. She is PLL Clear by parentage. 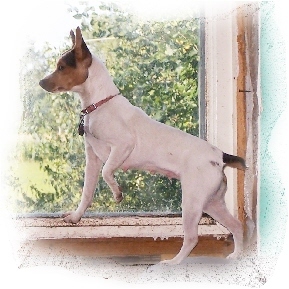 Rat Terriers of the past Click here to view pictures and info of Rat Terriers that appear in pedigrees of our Rat Terriers. Some of these dogs have passed on, some of them have found new homes and so are no longer with us, some are still with us but have been retired from breeding, some are dogs we never owned, but are ancestors or relatives of our dogs. 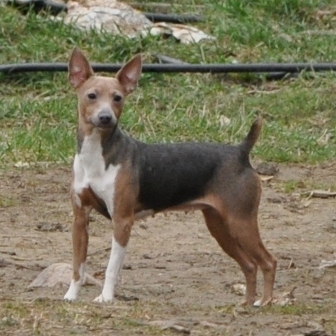 Rat Terriers were bred to be excellent ratters on farms. The sturdy little terries comes in different colors and sizes. 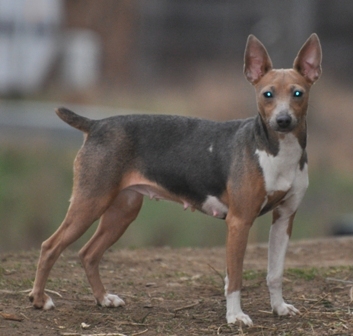 Our Rat Terriers come in a wide variety of colors. 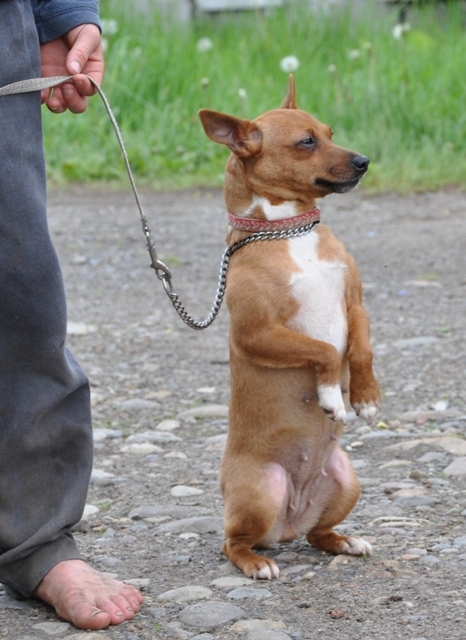 We have both upright eared as well as button eared dogs. 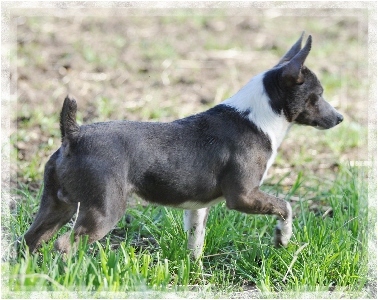 Some of our Rat Terriers have natural bobbed tails. 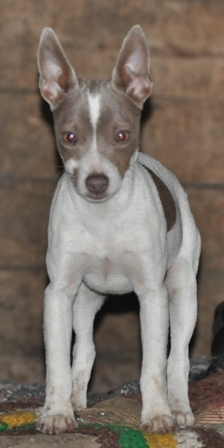 Our goal is to breed type A toy Rat Terriers (4-10 lbs) and and mini Rat Terriers (11- 18lbs) with great personalities. 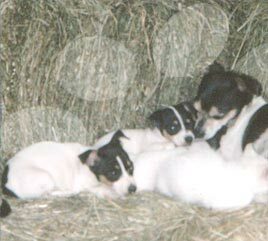 Our Rat Terriers are equally at home in the house with the kids or on the farm among the livestock. 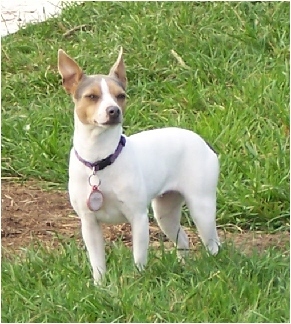 One of the best features of the Rat Terrier is their great temperaments. Most Rat Terriers get along exceptionally well with kids. Ours are raised in the house with the kids, so they are accustomed to them and are very comfortable around kids. (Of course, if your kids pull the dog's tail and poke her in the eye, then she's not likely to be very sweet in return, although they are very tolerant) They love to play with the kids, and have the right balance of energy and gentleness. Many love to retrieve balls, sticks, etc. Yet when you are ready to sit and rest, they are ready to snuggle in your lap. You probably can not find a better dog for kids anywhere. 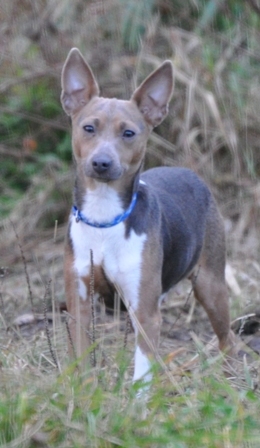 They tend to be less hyper and less aggressive than Jack/Parson Russell terriers are. Most Rat Terriers get along very well with other dogs. Some Rat Terriers get along very well with cats and some will harass them unmercifully. 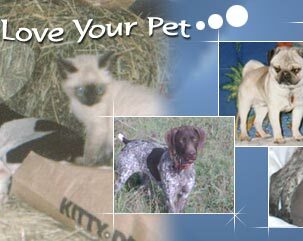 How they get along with cats depends some on the individual dog's temperaments, some on what other animals they have been raised with, and some on if they have been discouraged from chasing cats or not. 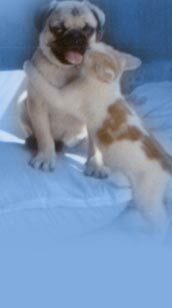 Many will get along with the family cat, but may go after a stray. 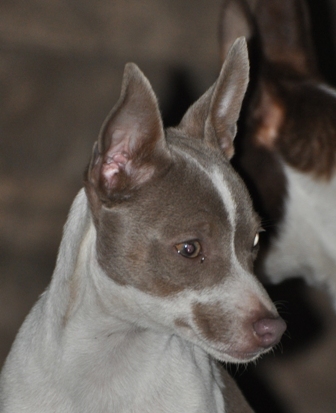 All our Rat Terriers are registered with the American Kennel Club, Universal Kennel Club and/or the United Kennel Club.